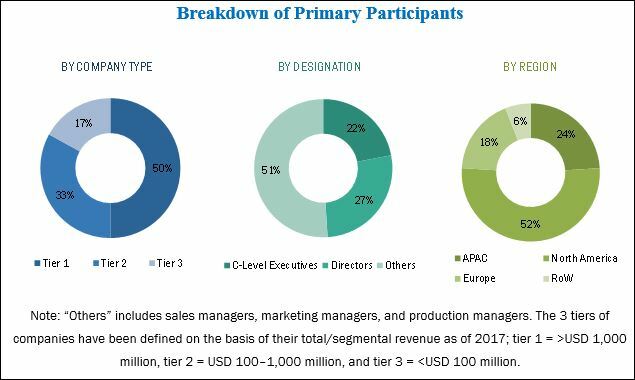 [162 Pages Report] The selective laser sintering (SLS) equipment market was valued at USD 274.3 million in 2017 and is projected to reach USD 947.4 million by 2023, for both equipment and material, growing at a CAGR of 22.8% during the forecast period, whereas the market for equipment, inclusive of SLS and DMLS, is projected to grow at a CAGR of 27.5% during the forecast period. The base year considered for the study is 2017, and the forecast period is from 2018 to 2023. This report provides valuable insights into the ecosystem of the SLS equipment market. Major players profiled in this report are 3D Systems Corporation (US), EOS GmbH (Germany), Farsoon Technologies (China), Prodways Group (France), Formlabs, Inc. (US), Sinterit sp. z o.o. (Poland), Renishaw Plc. (UK), Sintratec AG (Switzerland), Sharebot S.r.l. (Italy), Natural Robotics (Spain), Ricoh Company, Ltd. (Tokyo), Z Rapid Tech (China), Concept Laser GmbH (Germany), Aerosint (Belgium), XYZ Printing, Inc. (Taiwan), Dynamic Tools (Spain), Aspect Inc (Japan), and Red Rock SLS (Russia). Prodways launched ProMaker LD-3, a compact 3D printer, which will enable to produce professional-grade prototypes and compact designs. 3D Systems launched DMP Flex 100 and DMP Dental 100 3D printers for entry-level metal 3D printing and dental applications. Farsoon Technologies collaborated with Additive Manufacturing Technologies (AMT) to provide innovative post-processing solutions for additive technologies. Farsoon Technologies signed an agreement with Oerlikon to supply qualified Oerlikon AM metal powders for Farsoon additive manufacturing metal systems. Prodways acquired AvenAo, an expert in the integration of 3D design applications. Prodways acquired Interson-Protac (a major player in the field of audiology). The integration into Prodways Group will give Interson-Protac an opportunity to further migrate toward 3D printing and accelerate its expansion. GE Additive (parent company of Concept Laser) established Customer Experience Center in Munich, Germany. The center installed over 10 3D printing machines from Concept Laser and Arcam EBM to enhance customer knowledge about the additive manufacturing process—from design and prototyping to functional part production applications. Renishaw signed a partnership agreement with FalconTech Co., Ltd. (China) for extending the distribution of its solutions based on metal additive technology in China. With this partnership, FalconTech is expected to set up an additive manufacturing solutions center in Wuxi, Jiangsu province, using RenAM 500M AM systems of Renishaw. The overall selective laser sintering (SLS) equipment market is projected to witness significant growth during the forecast period. The market is growing due to the increasing government investments in 3D printing projects and the ability of SLS equipment to produce parts possessing good mechanical properties with no build support in industries such as consumer goods, automotive, aerospace and aeronautics, art and fashion, machinery and equipment, and healthcare and medical devices. The selective laser sintering equipment market is estimated to be valued at USD 339.5 million in 2018 and is projected to be worth USD 947.4 million by 2023, for both equipment and material, growing at a CAGR of 22.8% from 2018 to 2023, whereas the selective laser sintering equipment market for equipment, inclusive of SLS and DMLS, is projected to grow at a CAGR of 27.5% during the forecast period. The report covers the SLS equipment market segmented by laser type, material, application, industry, and geography. Laser types used in SLS equipment are solid and gas. By material, the selective laser sintering equipment market has been segmented into metal and nylon. The nylon segment has been subdivided into durable, glass filled, and fiber filled. By application, the market has been segmented into tooling, heavy equipment and machinery, and robotics. By industry, the selective laser sintering equipment market has been classified into aerospace and aeronautics, healthcare, automotive, consumer goods, machinery and equipment, and art and fashion, in which SLS equipment is used for creating prototypes. SLS equipment is capable of creating both prototypes and final products without requiring any support structure to hold the object while it is being printed. The growth of the SLS equipment market is propelled by the ability of SLS equipment to produce parts possessing good mechanical properties with no build support. Also, recent government investments in 3D printing projects and the ability of SLS technology to reduce manufacturing costs and time to selective laser sintering equipment market are propelling market growth. The market for metal-based SLS equipment is expected to grow at a higher CAGR during the forecast period. Due to extensive demand for sophisticated, accurate, and complex designs in aerospace and aeronautics, and healthcare industries (for medical devices and surgical instruments), metal-based SLS equipment is expected to witness increased adoption worldwide in the coming years. 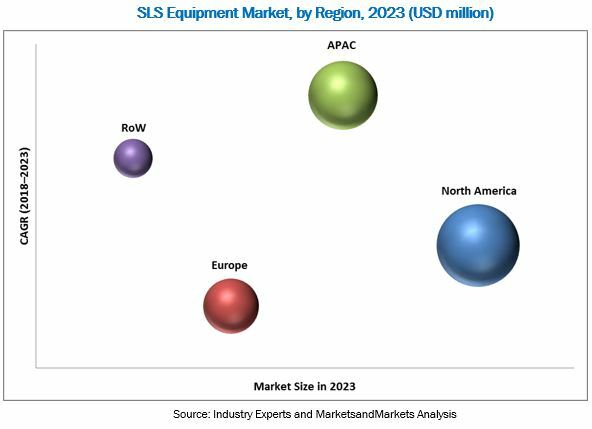 North America held the largest share of the SLS equipment market in 2017 owing to technological advancements and growing adoption of technology in a vast range of industries in this region. The selective laser sintering equipment market in APAC is expected to grow at the highest CAGR during 2018–2023 driven by the increasing adoption of SLS equipment in several verticals, such as consumer goods, aerospace, automotive, healthcare, and art and fashion. However, the lack of standard process control and difficulties in using SLS printing software inhibit the growth of the overall market. Complex operation and high risk associated with SLS equipment are among the major challenges faced by players in the SLS equipment market. In 2017, 3D Systems Corporation (US) and EOS GmbH (Germany) led the SLS equipment market. Farsoon Technologies (China), Prodways Group (France), Formlabs, Inc. (US), Sinterit sp. z o.o. (Poland), Renishaw Plc. (UK), Sintratec AG (Switzerland), Sharebot S.r.l. (Italy), Natural Robotics (Spain), Ricoh Company, Ltd. (Tokyo), Z Rapid Tech (China), Concept Laser GmbH (Germany), Aerosint (Belgium), XYZ Printing, Inc. (Taiwan), Dynamic Tools (Spain), Aspect Inc (Japan), and Red Rock SLS (Russia) are among the other companies operating in the SLS equipment market. Governments all over the world are undertaking initiatives and providing funding to educational institutions, research centers, and research and technology organizations to further explore the opportunities offered by 3D printing technology and encourage developments in the technology. Countries such as the US, the UK, and Canada have implemented national programs for promoting the university-level 3D printing research, which is driving technological advancements and the establishment of start-ups. The emergence of new applications for 3D printing has attracted industrialists and governments across the world toward the technology. A wide range of 3D printing technologies are being used to develop prototypes for use across industries—for instance, filament-based fused deposition modeling (FDM) that creates plastic prototypes; laser-curing processes that make parts from photopolymer resins; and powder bed fusion machines that produce fully dense metal and plastic components. Among these technologies, selective laser sintering (SLS) and direct metal laser sintering (DMLS) can cut costs through accelerated production; reduced tooling costs and work in process; less waste; and parts that remain strong despite being lightweight. SLS has been in the market for long; it was a patented technology until 2014. Since 2015, there have been considerable advancements in the technology, and SLS-based equipment has evolved. The industrial usage of SLS equipment has also increased and improved in the past 3 years. There have been several advancements in printers and printing technologies, and printing materials, and developments in the skill set of the workforce. Additionally, the selective laser sintering equipment market for metal-based SLS equipment is expected to grow in the near future. This is due to the growing use of metal-based printers across aerospace and medical devices industries. Within the medical devices or healthcare industry, SLS equipment is expected to be used for the 3D printing of surgical instruments. Hence, further advancements in SLS technology will offer opportunities for players in the SLS equipment market. 12.2.9 Sinterit Sp. Z O.O.